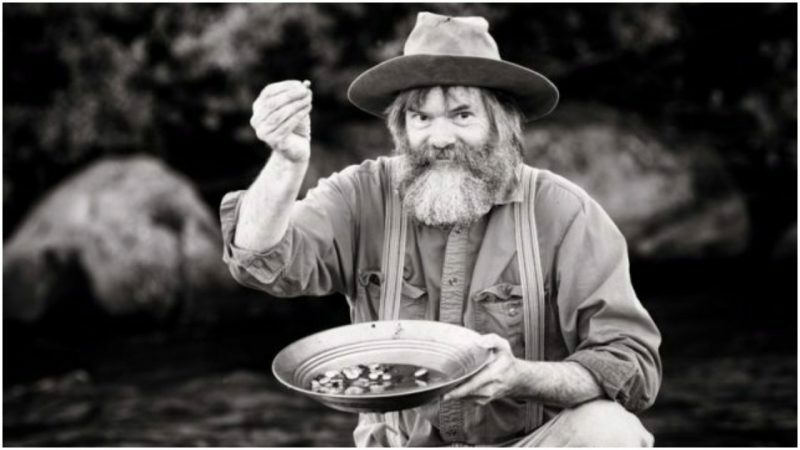 James Wilson Marshall’s discovery of gold flakes in the American River in the Sacramento, California, Valley in 1848 set off more than Gold Rush Fever. The non-native population of the territory exploded from less than 1,000 to more than 100,000, speeding its ascension to statehood (granted in 1850). A total of $2 billion’s worth of gold was extracted, though wealth was concentrated among the few. Even the U.S. president was swept up in the fever. “The accounts of abundance of gold are of such an extraordinary character as would scarcely command belief were they not corroborated by the authentic reports of officers in the public service,” President James K. Polk announced in a State of the Union address in December 1848. 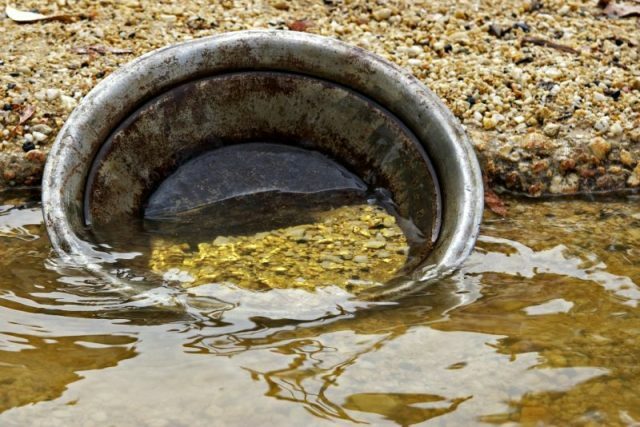 Like any dream of hitting the lottery, gold-mining required timing, luck, and hard work. The earliest to arrive in 1848 and 1849 fared well enough. Men (and a few women) poured into the region from ever-widening circles, by land and sea, first from the California area itself and nearby Oregon, then from as far away as Mexico, Peru, Hawaii, and China. They arrived with little more than they could carry. They needed food and tools. California’s remote location and sparse population meant most supplies were imported from vast distances. In just a few short months, prices for food, dry goods, and supplies tripled. As the major port where goods were unloaded and sold, San Francisco boomed. Edward Gould Buffum was the first journalist to write a book about the Gold Rush, Six Months in the Gold Mines, published in 1850. In it, he described having a breakfast of bread, cheese, butter, sardines and two bottles of beer with a friend and receiving a bill for a then staggering $43, according to Smithsonian magazine, the equivalent today of $1,326.70. Pans the miners used cost 20 cents before 1849, but soon rose to $8, or $246 in 2017 dollars. Boots cost $6, or $185. A shovel went for $36, or more than $1,000. Food was just as dear. The price of eggs rose from $1 per egg to $3, or $92.56. Rice was $8 per pound, or $246.83. Beer cost $10 per pound, or $308.54. By comparison, coffee beans, crackers, and oranges sound relatively affordable, at .51 per pound, or $4.63. [Calculations via inflation calculator at in2013dollars.com, which uses Consumer Price Index along with historical study conducted out of Oregon State University] Those starved for information paid a pretty price: Old newspapers sold for $1 each, or around $30 today. The merchant Sam Brannan built a store next-door to Sutter’s Fort, where Marshall first discovered gold. During the height of the rush, Brannan made $2,000 a day from miners. The region’s population continued to swell during the early 1850s even as the opportunity to strike it rich dried up. New manufacturing methods required capital and centralized control of deep-lode mining in the hands of a wealthy few. 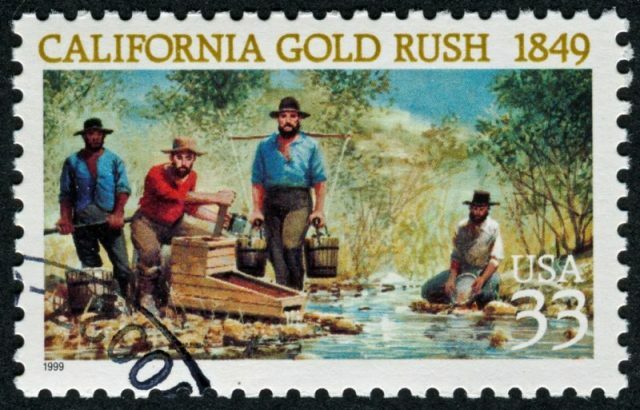 Some of the most iconic American entrepreneurs launched their careers and empires during the Gold Rush. The early seeds of Philip Danforth Armour’s meatpacking empire were planted when he went to California and sold food to miners. Levi Strauss peddled dry goods, including his sturdy denim cloth (though the iconic blue jeans weren’t manufactured until 1873). Henry Wells and William Fargo established a banking business. John Studebaker made wheelbarrows for miners. California had established itself as a major player in the U.S. economy.